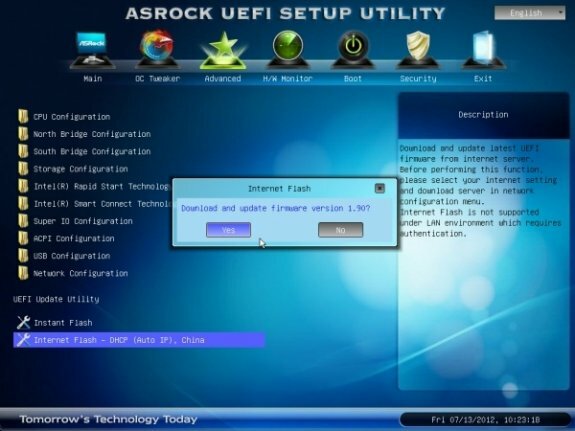 ASRock has developed an update to its UEFI BIOS program that lets it update itself from the web. All you have to do is point it to a working internet connection that uses the motherboard's onboard Ethernet controller. Once configured, the utility calls home to ASRock, checks if a newer version of the BIOS is available, downloads it, and updates itself, with minimal user-intervention. The feature cuts down time spent in finding the right BIOS ROM image online, and copying it to a USB flash drive. Unlike Intel's Express BIOS Update program, it does not need the motherboard to have any storage devices connected. Upcoming ASRock motherboards could ship with the feature, and select current ones could get this feature via a BIOS update.